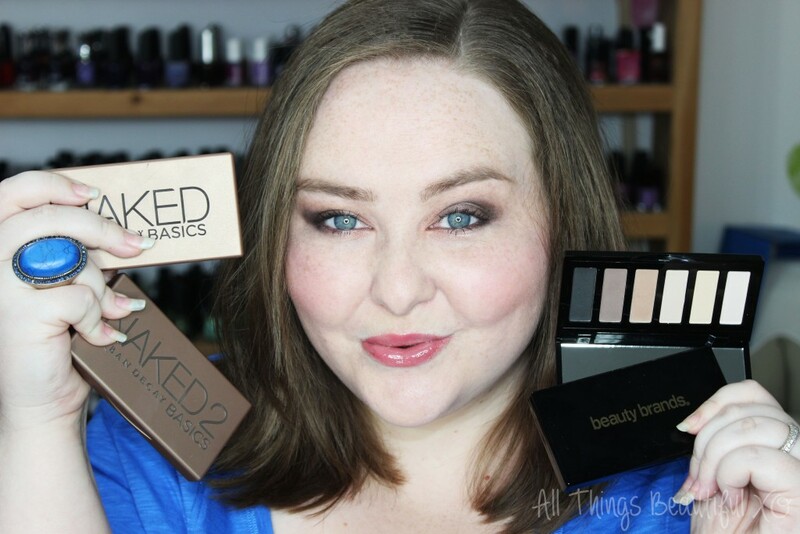 Beauty Brands vs Urban Decay Naked Basics Palettes Review, Swatches, & Eye Look + Video! Today I bring you a post I’ve been beyond excited about writing. A tale of dupes…a story of matte…& an eye look I’m in love with. On top of all that I’m talking about a bargain! If you love neutrals & snagging a great deal then you’re in the right spot! When it comes to neutral palettes Urban Decay is still likely the most well-known popular brand. From their trio of Naked palettes to the ever popular Naked Basics…Urban Decay is pretty much a no-brainer. 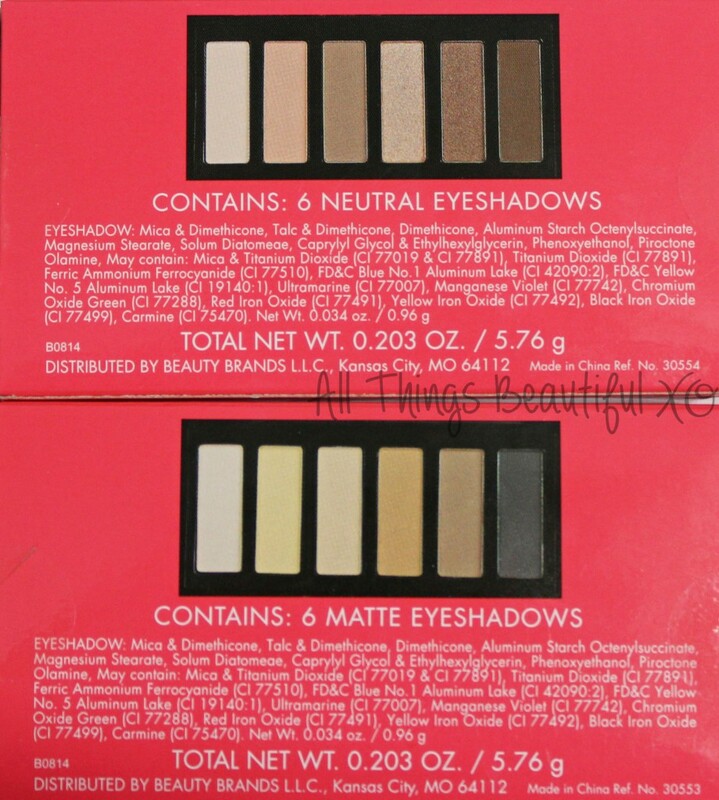 I stumbled upon a few palettes at Beauty Brands recently on display & immediately saw some serious similarities. I picked up the Beauty Brands Matte Mini Color Collection & the Beauty Brands Neutral Mini Color Collection. There was also two other palettes which I’ll discuss below! Both palettes are packaged the same way & are nicely sturdy. Black plastic on the exterior is fine with me & a full-sized mirror for the size of the palette as well is a nice touch. Some people might want a brush here…but I like not wasting the space to keep it quite compact. You’ll notice on the back these palettes also don’t contain much information on the back of the palettes themselves…you’ll either have to mark them or open them each time to know the difference. Here’s my video quickly talking about these- yessss I’m out of focus & I’m SO sorry. The eyeshadows WERE in focus though so I went with it. Please remember to give this video a like & subscribe to me on youtube! All swatches below are over primer like in the video. On the top is the Beauty Brands Neutral Mini Color Collection & on the bottom is the Beauty Brands Matte Mini Color Collection. The matte shades are very smooth & somewhat powdery but also easy to overblend to blend away. The shimmers are really beautiful in both texture & coloring. I feel like the two darkest shades in the Neutral palette are too similar as well as the two pale shade in the Matte palette. I’d be more upset but I feel the same about a lot of similar palettes as well likely because I am so far & they’re basically my skintone. From left to right we have the Beauty Brands Neutral Mini Color Collection, Urban Decay Naked 2 Basics Palette, Urban Decay Naked Basics Palette, & last is the Beauty Brands Matte Mini Color Collection. Because the two palettes closest in coloring are the Urban Decay Naked Basics Palette, & the Beauty Brands Matte Mini Color Collection so I decided to swatch them together. Top is Beauty Brands Matte Mini Color Collection Palette & bottom is Urban Decay Naked Basics Palette swatched again over primer. You can tell the Urban Decay shades are more pigmented & generally look more smooth. Hopefully you can also tell that these shades have a very similar idea & overall concept. If you’re on a budget or can pick up the Beauty Brands version on sale then it might be worth it for you! The Beauty Brands Neutral Mini Color Collection Palette is my favorite of the two palettes I purchased so I wanted to show you how they perform as well. I first primed my lid then used the soft rosy beige shade as an all over base color. I then took the matte taupe & applied it to my lid & added the shimmering cool-toned chocolate in my crease. The matte, darkest shade is in my very outter corner & the lightest shade is in my inner corner. I then tapped the shimmering beige to the middle of my lid lightly with my fingertip. Along with the Beauty Brands Neutral Mini Color Collection & Beauty Brands Matte Mini Color Collection they also have two other varieties- Beauty Brands Luminous Mini Color Collection & Beauty Brands Smokey Mini Color Collection. I passed on those two because I have tons of smoky-themed palettes & the Luminous version wasn’t on display. All 4 of the Beauty Brands Mini Color Collection Palettes retail for only $12 at this time so they would make a great stocking stuffer or gift for yourself! What are your favorite palette finds? Have you ever stumbled upon a great dupe? Have you tried anything from the Beauty Brands actual brand? I have a few of the Koco products I want to try as well!